Blue Man Group - "Audio"
I'm a die hard "junker". What I mean by that is I spend a lot of time in junk stores, second hand shops, pawn shops and flea markets looking for bargains. Most all of the places I frequent they have that black gold (vinyl), lots of used CD's and electronic gear. I always root through to see if anything new has arrived since my last visit. Last summer I stopped in at the local Agape House store. It's a second hand shop where the proceeds go to the local poor and homeless. It's kind of a small towns version of the Salvation Army or Goodwill. I feel good giving them my money. This particular day I struck it rich. Somebody donated just a ton of promotional CD's to the store. I guess a local record company promoter was unloading all of his old discs that he couldn't get the local radio stations to play. Actually, it was my (and soon to be your) good fortune. All of the CD's were priced at Fifty Cents each. Ooou Baby, my kinda deal. So I loaded up with stuff that I thought I might like, paid the nice lady at the register, and out the door I went, pleased as punch. 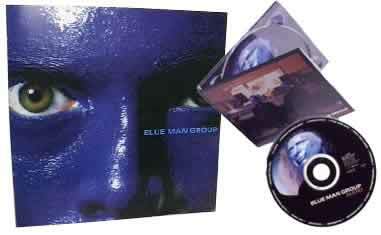 I popped in Blue … Man … Group. Hmmm. Never heard of them. (Wait, lets pause for a second, you need more info) See, I drive a Lincoln Towncar. A big red one. I equate it to driving a sofa with wheels. I put one of those killer stereos in it. You know, the ones THOSE KIDS have in there cars, the ones you can hear two or three blocks away? Yep, that's me too. I get some pretty strange looks sometimes. Here I am, 40+, bald, conservative looking, driving a Lincoln, but there's this really loud noise coming out of it. Go figure. Anyway, back to our regularly scheduled program. I usually do a quick flip through all the tracks picking up 20 or so seconds of each one to get a feel for the record. I did the same here. I liked what I heard so I flipped back to track one and settled in for some driving music. Listening to track one, I started turning up the volume a little bit ever few seconds thinking, hey, this is pretty cool. Pretty soon I'm at full volume then it happened. At 1:27 the drums kicked in. OH MY GOD!!!!!! I almost crashed, I'm not kidding. I had pull over and regain my wits. I sat there for a minute stunned. Then I played it again. This is REALLY cool. I went on to listen to the rest of the tracks, just driving around on a sunny afternoon with the windows down and the music at full blast. I'd occasionally pull over to get a better listen to a particular song. I thought to myself, this is great. But I didn't realize how great it was until I got home. After pulling into the driveway, I ran downstairs and slid it into my reference system. See, I've got this obscene reference system that's tri-amped, pumping out 520 unadulterated watts per channel of pure solid state bliss. Best of all, my wife wasn't home. Yah Baby, I can crank it until my head implodes. So that's what I did. Until I had gotten this CD, a lot of music was….well, boring sometimes. Don't get me wrong, I love music. It's my best friend (next to my wife and kids). Music takes me places I could never find on my own. On the other hand, I have never experienced multiple aural orgasms like this before. By track ten I was worthless (and there's fourteen tracks). I was just this quivering mass of fat, lumped on my comfy chair. There's a few things you need to know about these guys. The originators of this performance art group started back in the late 80's on the streets of New York. Over the years they have evolved into the group(s) we see today. They have live performances in New York, Boston, Chicago and Las Vegas. As part of their visual effect, they play music on really weird homemade instruments. Most of them are made out of PVC or fiberglass pipe and fittings assembled into visually interesting shapes. They use them as percussion instruments, just beating the hell out of them. Believe it or not, music comes out of these things. I know that sounds more than a little weird, but it works, REALLY well. They still use standard drum kits, guitars and synth's but they mix in their inventions to each of the songs. Here, you'll get a kick out of some of the names of their instruments, Big Drum, Drumbone, Air Poles, Back Pack Tubulum, Piano Smasher, Aronophonic and the list goes on. All of these "things" make music, really. If you watch commercial television, you can't help but to have noticed the Intel Pentium III commercials. 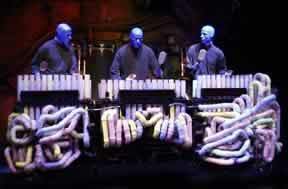 They feature Blue Man Group doing all kinds of strange things set to brief clips of their music. Speaking of the music, I'm floored by the recording quality on this release. It is really well done. I have no idea what these Blinstruments (Get it? new Blue Man instruments, heh!!) sound like in real life but the normal instruments are well done. In fact really well done. Sure they have some heavy processing done to them but if the processing is applied correctly, the result can be very good and almost unnoticeable. My hat is off to the recording and engineering crew on this one. It's VERY well done. Mega Kudos. This album is extremely intense in every sense. It's nearly primal in nature. What I mean is, it draws on your most rudimentary emotion of rhythm and drives it into a frenzy. It's fast, dynamic and in your face. It's almost pure percussion with some guitars and synth's mixed in for good measure. There's more stuff going on in the background music than you can grasp sometimes. I'm always hearing something new. Hey, they even mixed in some stereo bass. Yep, that's right, stereo bass. You don't hear that very often. Bottom line is, well if you haven't figured it out already, I like it, I like it an awful lot. If you are a hard driving Rock fan, I guarantee you will fall in love with this one too. This CD was meant to be played loud, not just loud, but REALLY LOUD, but be careful, it is a system killer. I've smoked 2 - 12" woofers on this one so far. See, the engineers like to live in that +4db range on lots of tracks. Especially in the bass region. They get pretty darned low too, nearly 20hz low. This will definitely give your speakers the workout of their (shortened) lives. Be sure to go to their web site. It's interesting, to say the least. I haven't seen their live show yet, but I'm going to. My real job takes me to Chicago on a regular basis. Next trip up, I'm there. Maybe I can swing even an interview with the founders :-) In the meanwhile, I'll have to settle for playing it on my stereo and hoping they put out a new music CD soon. Speakers, DIY - Tweeter - 30" Carver Ribbons, Mid-Bass - Focal 5K4211, Woofer - NHT 1259.